You remember the disastrous day I had a week or so ago? 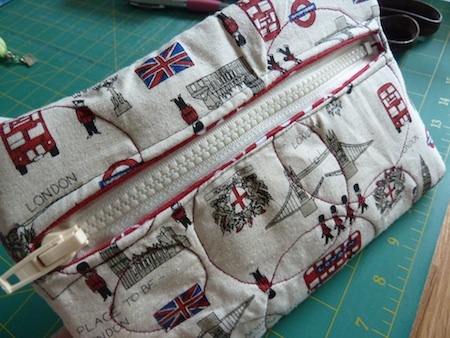 Well I salvaged what I could of the makings of the zippered pouch, altered the design and this is what I came up with. Of course I had to scorch in the corner to add to its imperfections. I also managed to finish a cashmere scarf for my husband and I’m pleased with that and so is he. I made a little carry pouch for his two ipad nanos and earbuds too. So while I haven’t had unqualified success with my crafty efforts recently, things are improving… I think. Is this great value or what? You know I showed you the cashmere scarf I made for my daughter here? Well, I’m knitting another one for myself and I’m just amazed at how much I can get from one ball of this 2ply cashmere yarn that I bought. I took some photos to show you. Take a look at the length of the current scarf, then check out what’s still left on the ball! And this is still the same ball that I used for the other scarf. 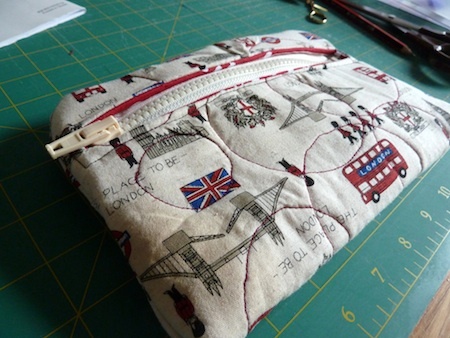 Hopefully I’ll be back to sewing again soon. I’m having to deal with packing up my sewing room ready for painting and new carpet etc. so I’m unwilling to spread stuff everywhere and sort out what I need until it’s finished. 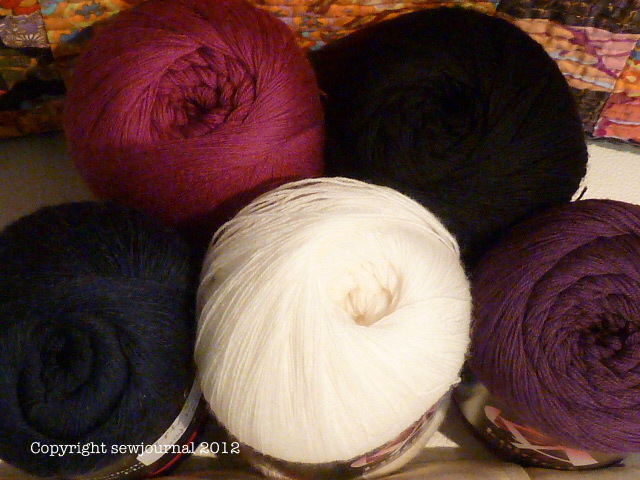 Beautiful 2ply, 100% Cashmere Yarn. Isn’t it lovely? 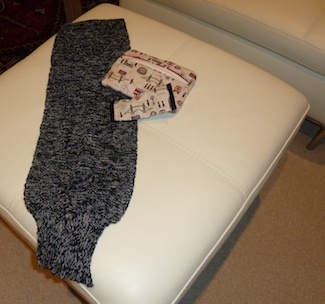 Can’t wait to start knitting with it but I have to finish my second cashmere scarf first. This week is my blog’s 2nd birthday and my ? ?th birthday. 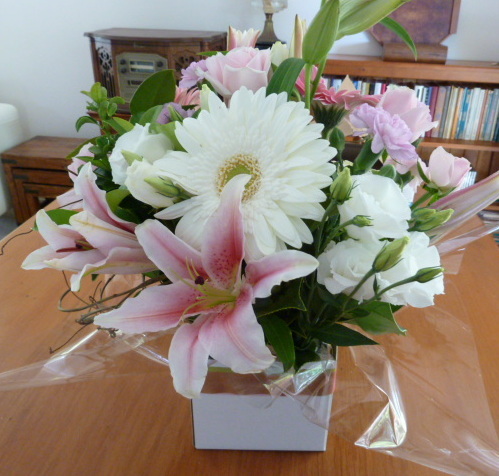 I was very lucky and received thoughtful gifts, money and flowers! Here are the flowers. 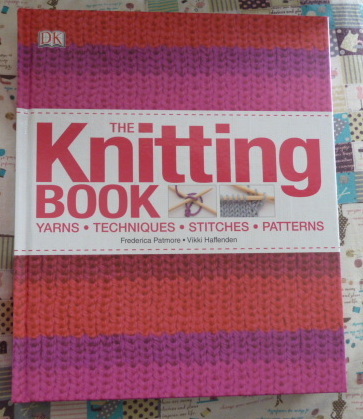 I also received The Knitting Book by Frederica Patmore and Vikki Haffenden. I haven’t had a chance to read it in depth yet but I have to say it has the clearest illustrations of knitting I have ever seen. It also seems to be extremely compehensive. 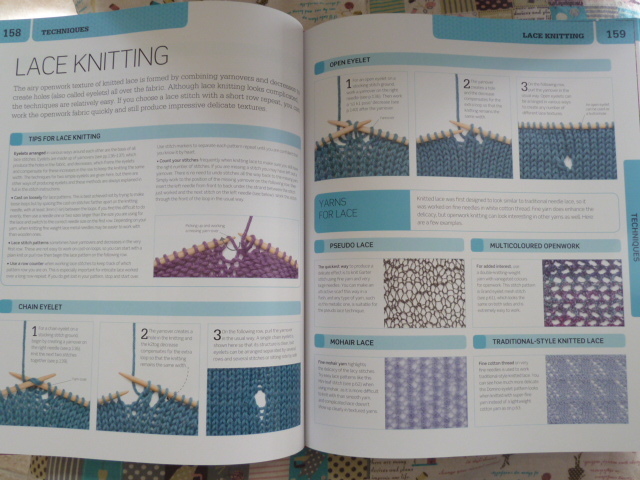 I’ve been knitting for many years and have tackled all sorts of projects from knitting Fairisle in the round to Kaffe’s interarsia methods and, more recently, lace and there’s still heaps I can learn from this book. 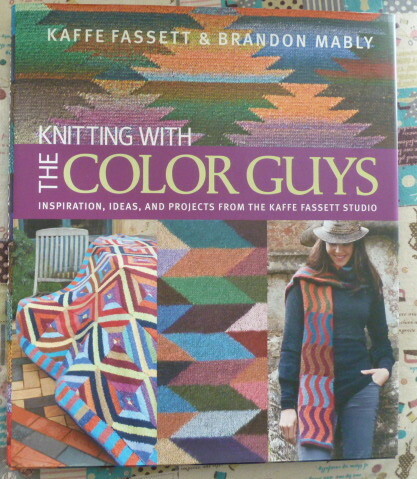 And speaking of Kaffe, my daughter bought me The Color Guys by Kaffe Fassett and Brandon Mably. 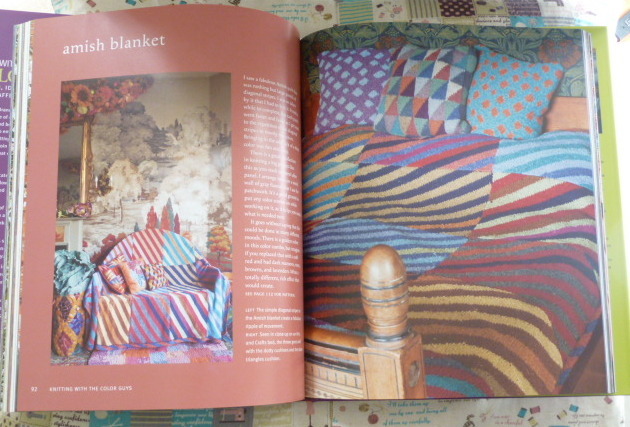 A real feast for knitting eyes! If you’re interested in either of these books, click on the title link (affiliate link but it costs you nothing) and it’ll take you to the Book Depository which I have found has the best prices. 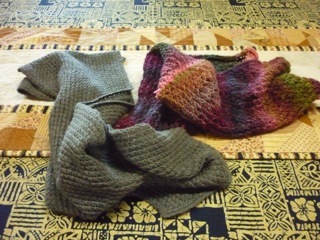 Last weekend I washed and blocked the Japanese Feathers Scarf I’ve been working on. 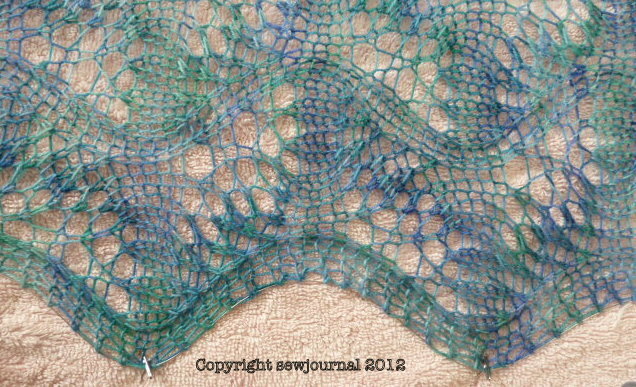 These flexible, superfine blocking wires make it so much easier than when I blocked the shawl with pins alone. Anyway here’s the finished article. I showed it to my daughter on a FaceTime call the other day and she likes it so it should be winging it’s way to the northern hemisphere sometime soon. 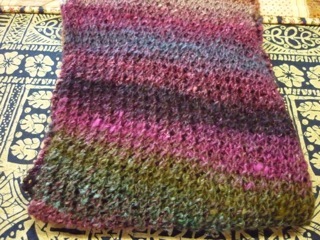 I used a 2ply 100% Italian Merino Yarn called Ella Rae and 4.5mm needles. 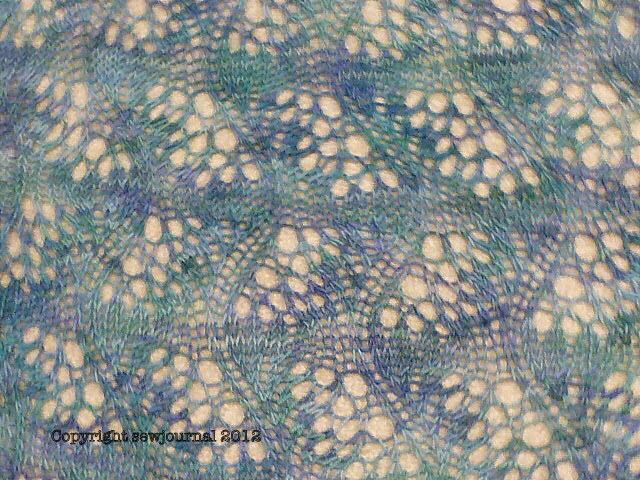 I got the pattern for the Japanese Feather Lace stitch from the the Knitting Fool Website here. 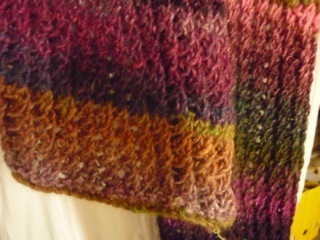 The stitch pattern uses multiples of 11 plus 1 but I added three knit stitches at the beginning and end and used 6 repeats. 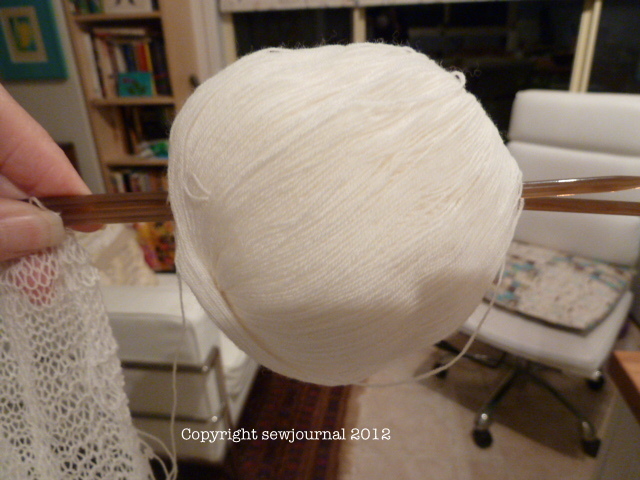 So I cast on 73 stitches. 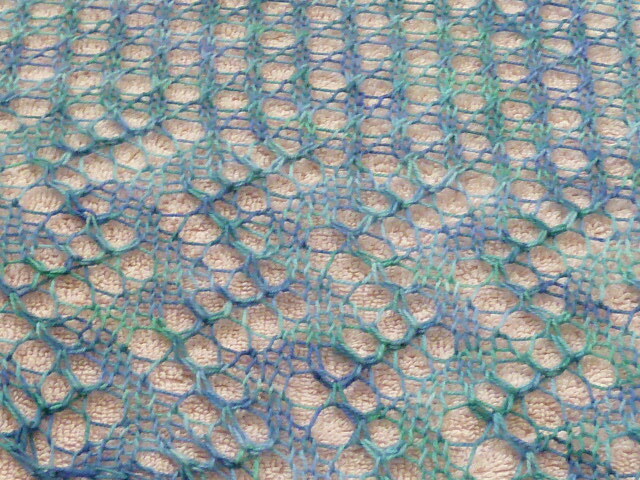 Rows 4 to 32 knit 3 – follow the lace pattern here – knit 3. 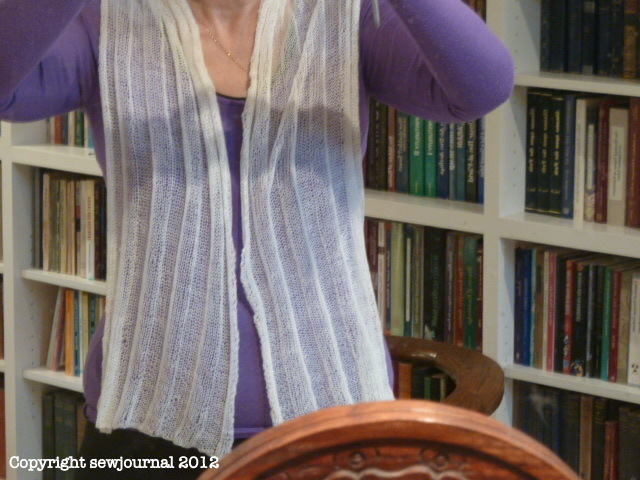 Repeat the last 28 rows until your scarf is the desired length then knit 3 plain rows. Blocking Wires, Yarn and Chocolate Cake! 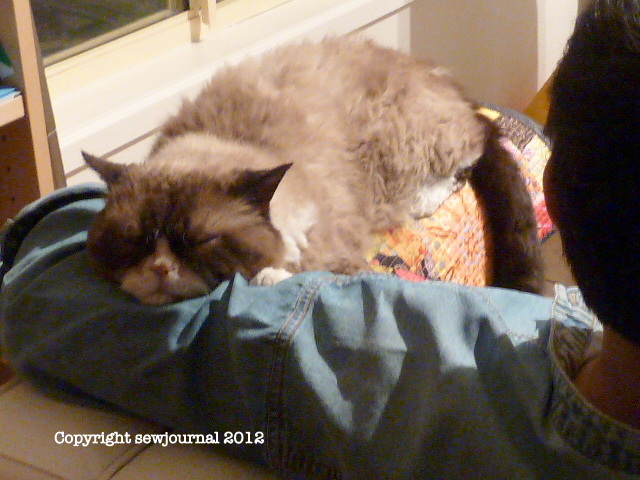 I’m sorry I’ve been absent but I’ve been very busy and and a little “blog-lazy”. I’ve finished knitting my Japanese Feather scarf and the other day my ultrafine blocking wires arrived so I’m hoping to get it blocked this weekend so I can show you the finished product next week. I bought these from Inspinknity and I notice at the moment they have free US and Canada shipping and $5 international shipping until the end of the 31st March. If you’re in the market for these then you better be quick. 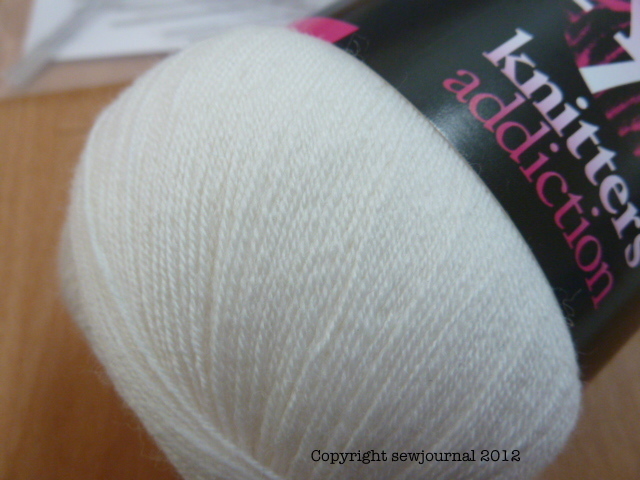 I also bought a ball of the finest Cashmere 2ply I have ever seen from Knitters’ Addiction. It’s so fine (100g = 1000 yards!) 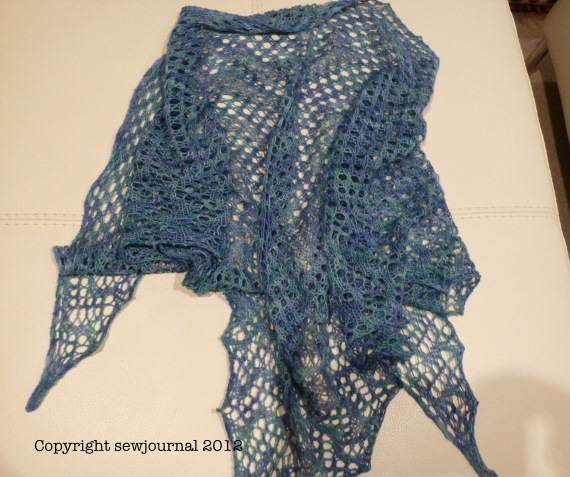 that I really gave up on knitting lace with it because it looked so unstructured. It is no exaggeration to say that I knitted and undid at least 15 or 20 different patterns trying to find one that looked good with yarn this fine. The photo doesn’t really show you how fine it is. A friend actually thought it was single ply it is so fine. I ended up opting for a 6 stitch rib which is light and airy and classic. I’ll show you soon. I have found what I believe to be THE BEST chocolate cake recipe I have ever tasted. I found the recipe on the Cadbury site here. You know me though, I had to tweak it a little. My tweaks were: I substituted Flora ProActiv Buttery margarine for the butter and I added 1 cup of frozen raspberries to the final batter. I didn’t make any icing/frosting as I didn’t have icing sugar in my pantry but it really didn’t need it. 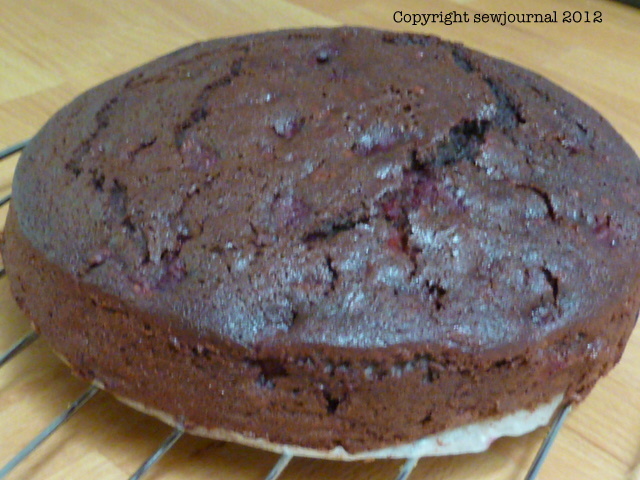 The cake was rich and moist and light and it really didn’t leave you feeling weighed down. It was so moist and the raspberries just took it to a whole other taste sensation! What’s more as the cake aged it got moister and tastier not drier. A real winner! Well all that careful, if amateurish, blocking paid off. 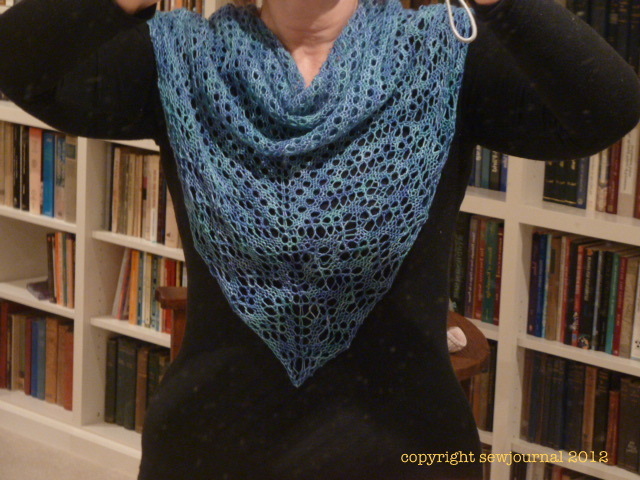 Here’s the finished shawl and I’m really pleased with the way it turned out. 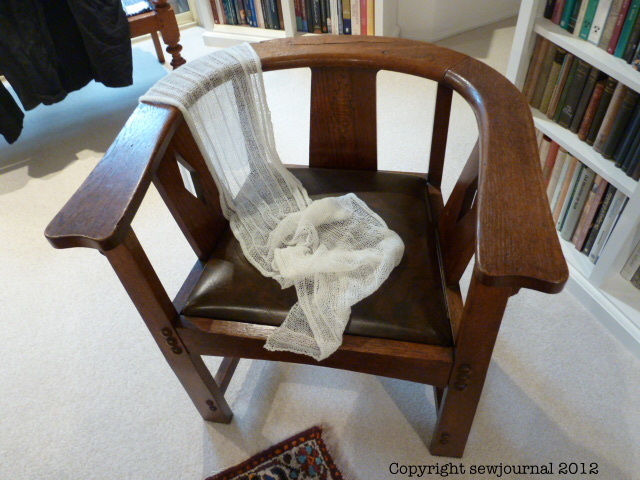 I took the “crumpled” photo so you can see how beautifully it drapes. 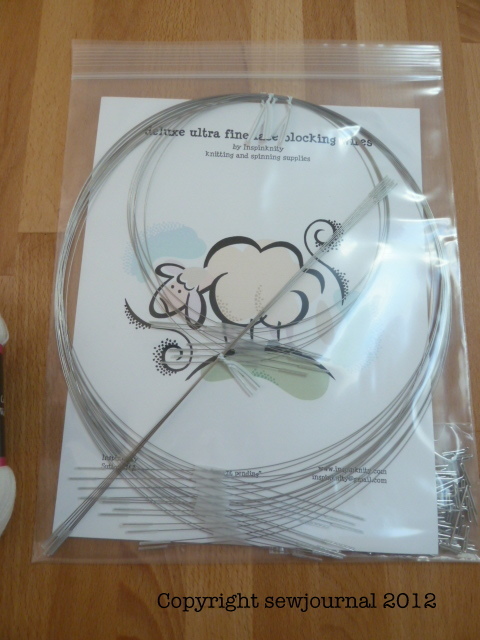 I do have a question for you experienced lace knitters out there. 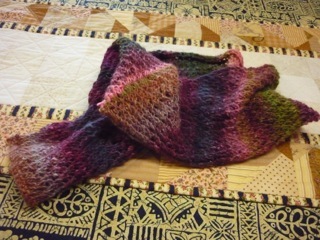 Do you have to re-block the shawl every time you wash it?? 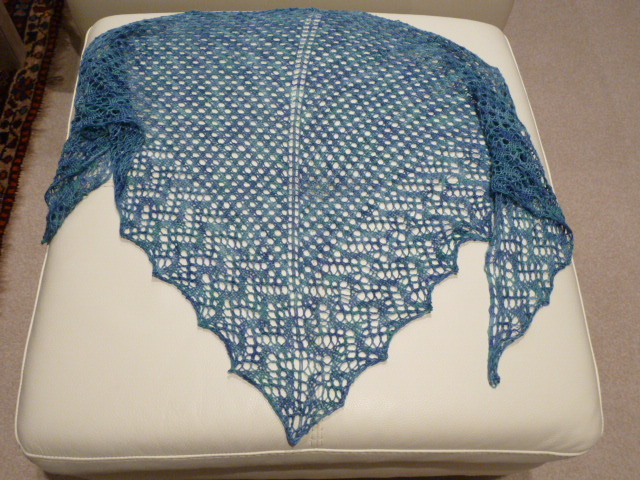 This shawl pattern was a free one from Ravelry called Easy as Pie by Marisa Hernandez. You can access it here if you’re interested. 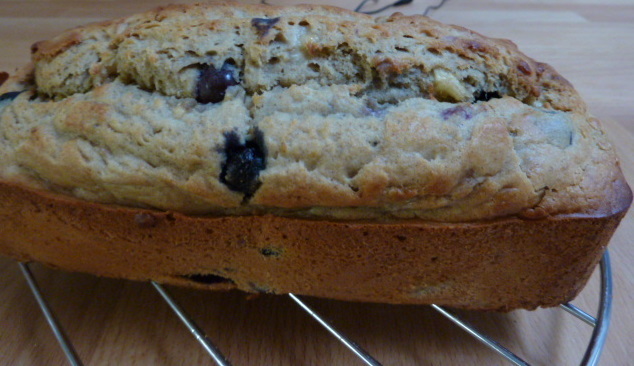 And just to divert myself because a watched, blocked, shawl never dries I whipped up this Banana and Blueberry cake with no added sugar. It really is delicious.If you’re interested I can post the recipe. 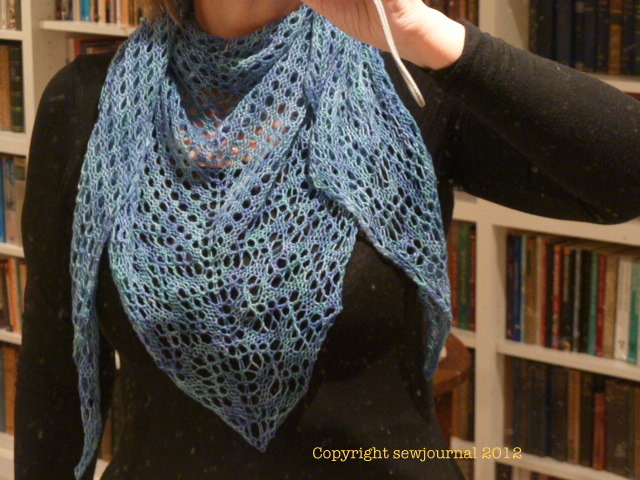 I’ve finally finished my lace shawl! I think I spent more time unknitting than knitting on this one. 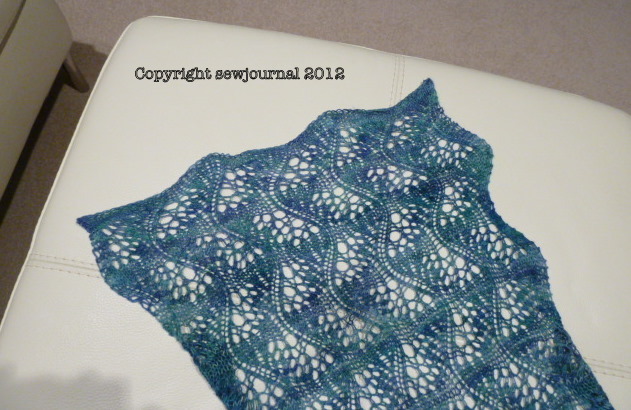 The next task was to block the shawl. However, I do not possess a blocking board, blocking wires or T-pins so I had to make do with what I did have – a room whose carpet will be replaced shortly (I hope), a couple of towels, some of those two pronged pins and some quilting safety pins. Here’s the not completely satisfactory result. Let’s hope it’s all right when it dries.